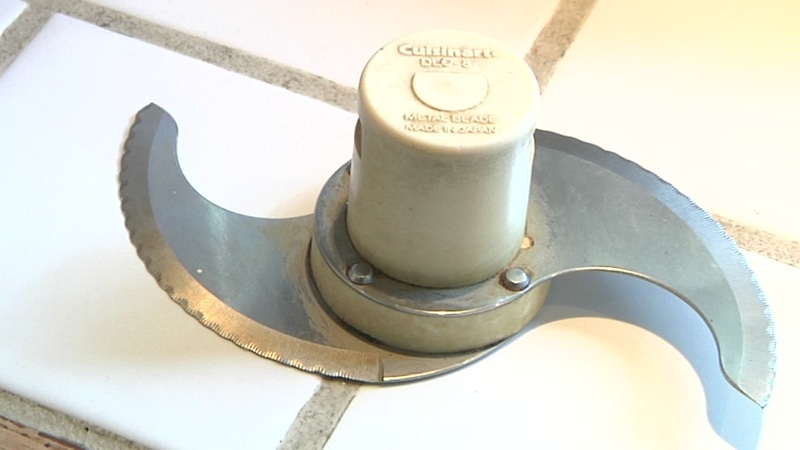 SAN FRANCISCO (KGO) -- It's been nearly a year since Cuisinart recalled eight million of its popular food processors because the blade could spray metal fragments into chopped food and some customers are still waiting for blade replacements. Not only are customers still waiting, but many may unknowingly be using the potentially unsafe blades. Seven On Your Side visited Cuisinart user Sue Anderson of San Mateo, who said her food processor was the top tool in her kitchen. Sue couldn't make some of her favorite recipes like minestrone soup and plum jam. While her Cuisinart sits idly by, she's chops by hand which she says "doesn't cut it" for those recipes. Cuisinart said the blades, held together by rivets, can come apart and spray metal pieces into the processed food. The company received 69 reports of broken metal, and 30 customers said it cut their mouth or teeth. Anderson says she stopped using hers immediately. "I don't want to throw out a whole batch of jam, worrying there might be metal fragments," she said. Cuisinart promised a swift replacement, but Sue and others said they were still waiting. "I use that blade for everything, especially my minestrone soup,'' she said. "It's my number one utensil." William Wallace of Consumer Reports said it's the largest recall of a small kitchen appliance in the nation's history. "It's unbelievable to me and us at Consumer Reports that it's taken this long to get consumers replacement parts for a kitchen appliance,'' he said. Anderson said she's been calling the company every month since last January. " I would call and say 'where's my blade?' And they would give me the same story: 'We're backlogged because we ran out of blades.' I said to him, 'I'm going to call 7 On Your Side.'" She did, and so did a half dozen other customers. So, 7 On Your Side contacted Cuisinart, and the company released a statement saying, "Cuisinart has been working around the clock to fulfill the high volume of requests for new blades. To date, we have shipped out approximately 90 percent of the replacement blades that were requested." Cuisinart did not say how many consumers requested a blade, or how many might still be using the old ones. Often consumers are unaware a product is under recall. Anderson said her two grown daughters didn't know about the recall and were still using the unsafe blades. Seven On Your Side also found several of the old blades for sale on eBay. When our staff contacted eBay, it removed the items immediately from the site. By law recalled items are not allowed to be sold. The recalled blades have four rivets that hold the blades onto a yellow center piece. The rivets can come loose and send pieces of blade flying off. If you have one of these blades, it could be unsafe. As for Anderson, shortly after she contacted 7 On Your Side she found a surprise on her doorstep. "Lo and behold, the blade," she said. "I was like, oh thank you 7 On Your Side." If you have an older Cuisinart food processor, check the blade to see if it's under recall. You can tell by the rivets and by the model numbers. Click here to find out if your Cuisinart food processor was recalled.